Large trucks such as semi-trailers have a high clearance under their carriages that can become hazardous in an accident with a passenger vehicle. 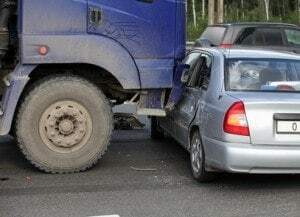 One of the most common serious injury accidents involving a large truck and lower vehicle such as a car or family vehicle is when the passenger vehicle slides under the large truck, crushing the top of the vehicle. This type of crash is referred to as an under-ride or undercarriage accident that can cause severe bodily injuries and fatalities. Most underride accidents involving large trucks involve a passenger vehicle hitting the truck from behind and sliding under the trailer of the truck. The problem lies in that the trucks are high enough to allow most hoods and bodies of vehicles to clear the undercarriage of the truck, but the windshield, roof and passenger area of the vehicle is crushed or sheared off as the vehicle slides under the truck. According to the National Highway Traffic Safety Administration, these truck accidents are a significant cause of catastrophic injuries and fatalities every year. The Insurance Institute for Highway Safety also performed a study on truck underride accidents, looking at 1,000 truck accidents that occurred between 2001-2003. 115 of these crashes that involved a passenger vehicle hitting the rear of the truck, 78% were underride accidents. 23 of the 28 accidents that ended in a fatality in the passenger vehicle, underride damage was reported. To prevent underride accidents, the Federal Motor Carrier Safety Administration has required that large trucks use both rear impact guards and reflectors or reflective tape since 1998/1999. However, the guards only are required on trucks that were made after 1998, leaving many without the guards. Although both these safety requirements are meant to reduce underride accidents, there is a question of whether they are useful. The Insurance Institute for Highway Safety performed a crash study on the effectiveness of rear impact guards. They found that even at speeds as low as 35 MPH, guards could tear off or bend forward, allowing the passenger car to still slide under the truck. Also, even in rear-end collisions that were not head on 100%, with the passenger car only hitting the rear of the truck partially, there was still a high number of underride accidents, even with guards. Commercial truck accidents can be complicated to resolve if there is more than one entity liable for injuries and fatalities. To ensure that victims receive the compensation they are entitled to, the expertise of an experienced Illinois truck accident attorney who has successfully prosecuted similar cases. Rosenfeld Injury Lawyers LLC represents people who have been injured in truck accidents throughout Illinois and across the country. We invite you to speak to one of our attorneys for a free consultation where you can discuss your legal rights following a collision involving a truck. Contact us today!